New authoring tools can make creating flash components for customized applications, or shareable repositories of learning objects much easier to do. In this way, some of the early promise of learning objects and LO repositories can be realized, and the high expense plus time lags can be reduced. Welcome to an interview with Robert Penn of Suddenly Smart, an innovator in the area of flash-based learning module authoring tools. What is your name and your involvement in e-learning / training? My name is Robert Penn and I’m the CEO of Suddenly Smart, a provider of e-learning authoring software and services. I had my first exposure to training and professional development when I worked for Accenture where I taught workshops on emerging information technologies. I’ve always been interested in how people learn and how we can use training to make a lasting impact on skills and behavior. After a number of years in consulting, I co-founded a company in 1999, Pacific Light Technologies, which developed interactive e-learning. In the process of developing these courses, we ran into difficulty trying to rapidly develop effective content and were forced to develop some of our own authoring technology. Realizing that many others were facing similar challenges, we changed tack and created Suddenly Smart in 2000 to develop and market our SmartBuilder authoring system. Suddenly Smart’s primary focus is our award-winning e-learning authoring tool called SmartBuilder. SmartBuilder is used to create self-paced e-learning. You can think of it as a sort of "Flash for dummies". In other words, it provides the power and flexibility needed for creating rich, interactive learning experiences, but you don’t have to be a programmer or to use it. The learning curve is about 2-4 days versus many months for Flash. The goal is to empower trainers and instructional designers to actually develop their own content rather than having to hand off designs to programmers for development. How is suddenlysmart.com's vision of flash authoring different than, say, those that focus on animation? Is your product web-based, or does one download it to a computer? Where can one save the flash files once they're created? Flash does a great job of creating animations for things like a talking character, or a simulation of moving parts in a machine. SmartBuilder is different because its focus is on creating meaningful interactivity, interactivity that leads to behavioral changes in learners. 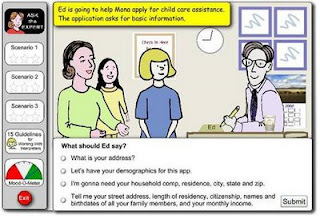 For example, you could use it to create a case-based e-learning exercise, a branching scenario, or a real world task that the learner might face. Zooms, fades, spins and slides can be created in SmartBuilder, and richer animations can be created in Flash and embedded in SmartBuilder lessons. SmartBuilder is a web-based product, which enables it to provide a number of collaboration and content management features. It generates Flash courses that are downloaded from SmartBuilder and run independently of the tool. The courses can be delivered from a website, an LMS, a CD-ROM, or whatever delivery platform is required. Please describe two different ways that suddenlysmart.com has been used in course design. Our clients are always turning out great courses designs, so it’s hard to pick just two, but if I must… Hennepin County used SmartBuilder to create a wonderful module on how to work with interpreters. They included branching feedback to make the scenarios more authentic, and even included a fun mood-o-meter for intrinsic feedback. The Nature Conservancy used SmartBuilder to create a business planning course. They included a robust assessment whereby learners are directed back to specific topics in the module for remediation if they answer a question incorrectly. They also used SmartBuilder’s translation features to repurpose the course for Spanish speakers. How does SmartBuilder make meaningful interaction possible? For skill building, the most important element of learning interactivity is contextual relevance. 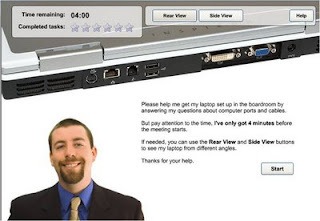 In other words, if you needed to train employees on how to use the ports of their laptop, you’ll have much greater motivation, recall and transfer if the exercise throws them into a situation where they need to set up their laptop for an important presentation in the board room, than if you provide them with, say, a who wants to be a millionaire game. To help create these experiences, you can’t rely entirely on templates since each learning situation is, to some degree, unique. So, in addition to providing templates, SmartBuilder also provides a free-form layout of objects such as text, graphics, and buttons. Another key element of meaningful interactivity is to provide individualized, intrinsic feedback. As the learner makes choices, they should see the impact of those choices on real world indicators that they care about, such as seeing what a customer is thinking as you speak with them, or seeing a clock run down if you make poor choices in a time sensitive scenario. SmartBuilder provides point-and-click menus for setting up this type of logic so that authors don’t need to learn any kind of scripting language. 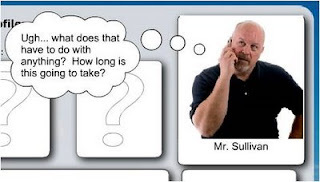 Have you thought about using suddenlysmart.com's authoring tools in building assessments? Yes, you can use SmartBuilder to create multiple-choice, fill-in-the-blank, and other traditional assessments, but you can also go beyond these formats, when needed. 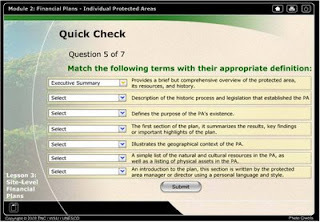 For example, you could decide exactly when a question should be asked, such as when a video is completed; you could ask different follow-up questions depending on whether an initial question is answered correctly or not; you could store results to be displayed in a certificate, and so on. How might the flash authoring tool be used to develop an assessment that would work with a skills or knowledge competency matrix? That’s a great question. Did you ever notice that you can pass a lot of quizzes without reading the material? Or, did you notice that many people can pass quizzes and yet not do anything differently on the job? Unfortunately, passing a quiz really just indicates that a learner has successfully stored some fact or data in short term memory. An isolated fact or piece of knowledge does not indicate skill competency. A more accurate indicator of competency would be to provide a series of learning by doing exercises and then track successful completion of the exercises. Let’s say you wanted to assess interviewing competency. You could create an exercise where you have to actually interview a simulated job applicant. You could include decision points to test competency with supporting skills and knowledge needed for the terminal skills. This might include avoiding asking illegal questions, noticing body language, taking good notes and so on. This approach would kill two birds with one stone: first, learners would actually improve their skills as they make mistakes and repeat the exercises, and, you’d have a much more accurate indicator of competency upon completion than you would have by presenting a traditional multiple-choice style assessment. Do you have any plans for new applications? Yes, we’re working on a new version of SmartBuilder that will be even easier to use, yet more powerful. If any of your readers are interested in providing feedback on this or joining our beta program, we’d love to hear from them. Please email beta@suddenlysmart.com to request information on this. How do you envision developing human capacity in the future? Our ultimate vision is to achieve what they did in the move The Matrix where the character Trinity learns how to fly a helicopter in about 10 seconds – that’s Suddenly Smart!…but we still have a little way to go before we get there!